I’ve got Deadly Eyes…One look at you and I can’t disguise…that I’m reviewing a sh*tty 1982 tax-shelter picture in which Dachshunds and Yorkshire Terriers are dressed to look like giant killer rats. The genres that benefited the most from the CCA were horror and exploitation. Quite a few great films came out of the tax-shelter era such as The Changeling, Black Christmas, Rituals, Curtains*, and the Cronenberg classics Shivers, Rabid and The Brood. But the chaff far outnumbered the wheat. 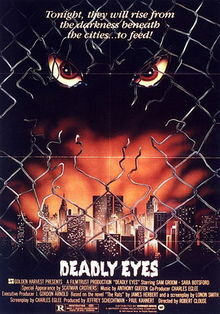 Deadly Eyes is a prime example of the former. The credits indicate that Deadly Eyes is based on the novel “Rats” by James Herbert, but the film’s screenwriter freely admits to never having read the source material. Needless to say, Herbert was not pleased with what he ended up seeing on screen; a feeling no doubt shared with audiences who plunked down their hard-earned shekels to see this shite. Almost every tax shelter film had at least one token American star and in this case it’s Scatman Crothers, fresh off The Shining. Crothers speaks about three lines before becoming rodent chow. The screenwriter, who doubled as co-producer, says that the bulk of his on-set responsibilities amounted to “making sure Scatman had enough weed” to get through the shoot. As mentioned, the giant rats were actually dachshunds and other small dogs in rat suits. Amazingly each pup had to be individually sized and fitted for their costume. “Can I get Rover to wardrobe!” The actors were reduced to stuffing their pockets with dog food to entice the “rats” to chase and attack them. The most entertaining part of the film involves the city’s (non-crack smoking) mayor commemorating a subway extension (in Toronto, please!) which will go all the way to the new State Street Station, where a black-tie gala awaits complete with oompah-pah band. En route, a rat nibbles through a power cord which causes the train to go out of service. As a Torontonian who rides the subway on a daily basis, I’ve seen more than my share of giant rats and have experienced many an interminable subway delay so I appreciated the movie’s lone stab at realism. Die Rückkehr der Killerratten, as the film is known in Germany, has pretty much nothing going for it save for the sheer ridiculousness of the costumed canines. Willard it ain’t. Shoo, Deadly Eyes, Shoo! This entry was posted in Strange cinema and tagged 80s horror movies, Canadian film by Really Awful Movies. Bookmark the permalink.